Trucking Penticton | About Us | Cats Heavy Haul Ltd. 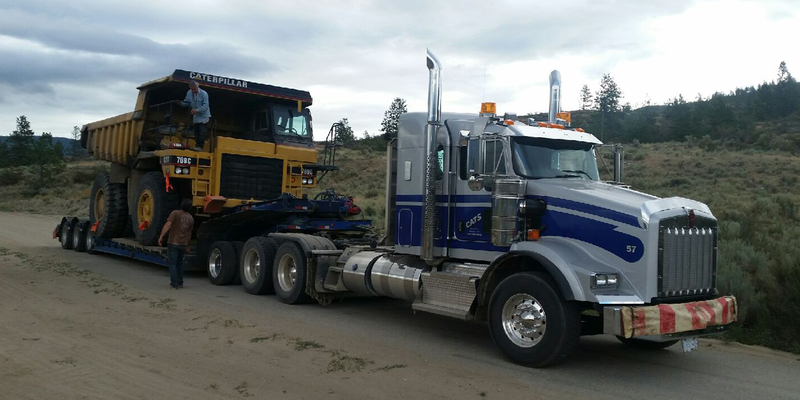 Locally owned and operated in Penticton, BC, Cats Heavy Haul is a family-run business specializing in moving industrial equipment on lowbeds, as well as transporting machinery on its own wheels. With over 30 years of experience, we are fully equipped to take care of your heavy hauling and equipment transportation needs. Plus, we’re fully licensed and insured for your peace of mind. Cats Heavy Haul incorporated in 2005 after purchasing the assets of Kats Lowbed Service Ltd. which operated in the South Okanagan for 25 years. Today, we have an extensive fleet at our disposal and serve a variety of industries including the forestry, mining, and construction sectors. All Cats Heavy Haul trucks are equipped with light bars, floater plates, and all necessary signage for maximum over-dimensional loads in the provinces of BC, Alberta, and the Yukon. We’re committed to maintaining the quality of our trucks, and we update them about every 4 years to ensure that we have the best possible equipment that you can rely on. Contact us today to learn more about our trucking services!